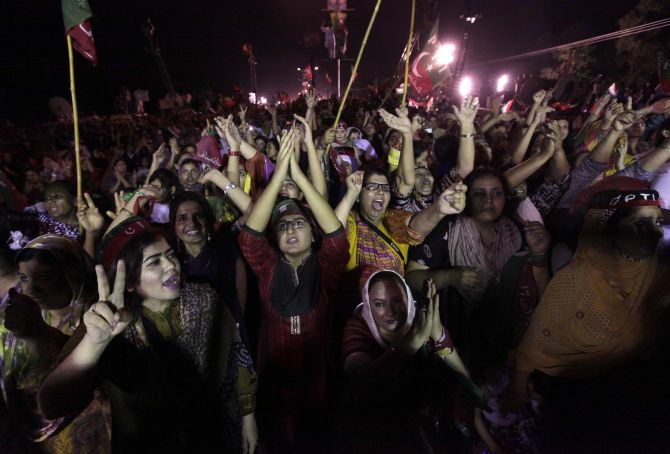 Supporters of Imran Khan, cricketer-turned-opposition politician and chairman of the Pakistan Tehreek-e-Insaf, react while listening during the Freedom March in Islamabad. 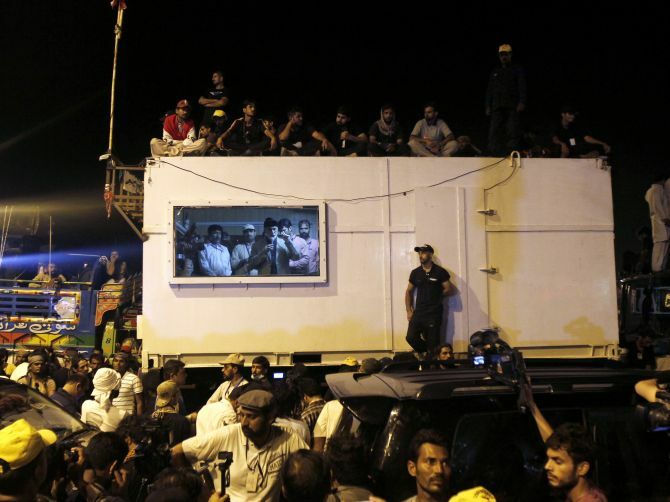 Protesters entered the capital's central “Red Zone” and have camped there since Tuesday night demanding the ouster of Pakistan Prime Minister Nawaz Sharif. Supporters of Mohammad Tahir ul-Qadri, Sufi cleric and leader of political party Pakistan Awami Tehreek, wear protective gear and stand outside the parliament house in Islamabad. 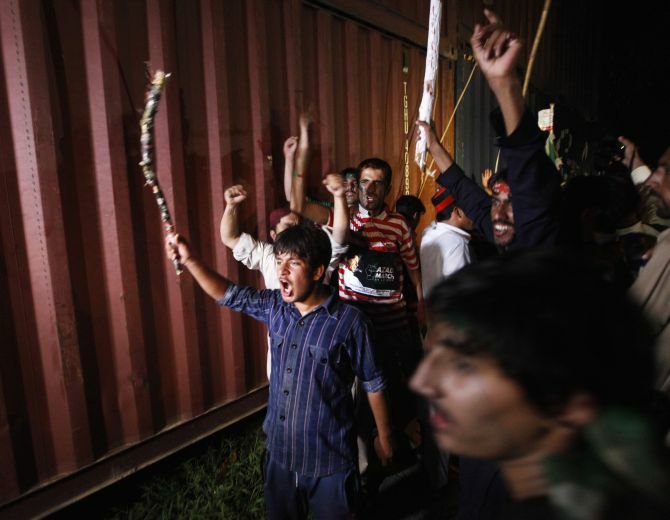 Protesters using a crane and bolt cutters forced their way past barricades of shipping containers in the capital Islamabad. Mohammad Tahir ul-Qadri, Sufi cleric and leader of political party Pakistan Awami Tehreek, gestures to his supporters from the window of a container while addressing them outside the parliament house in Islamabad. 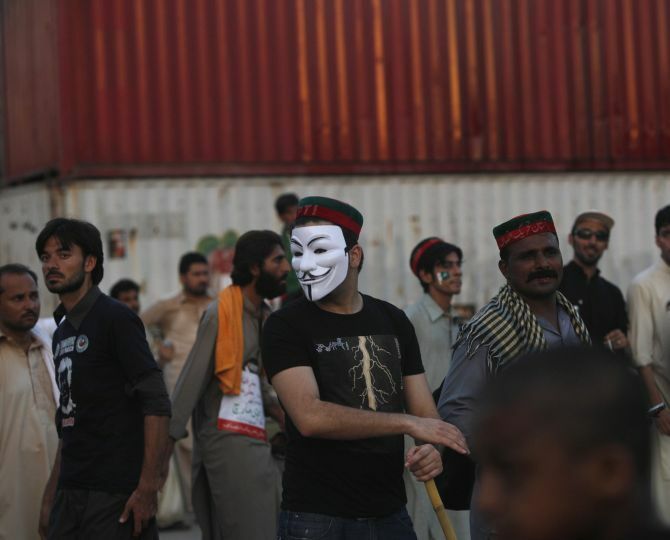 A supporter of Imran Khan wears a mask as he stands with others in front of container barricades during the Freedom March to the parliament house in Islamabad. 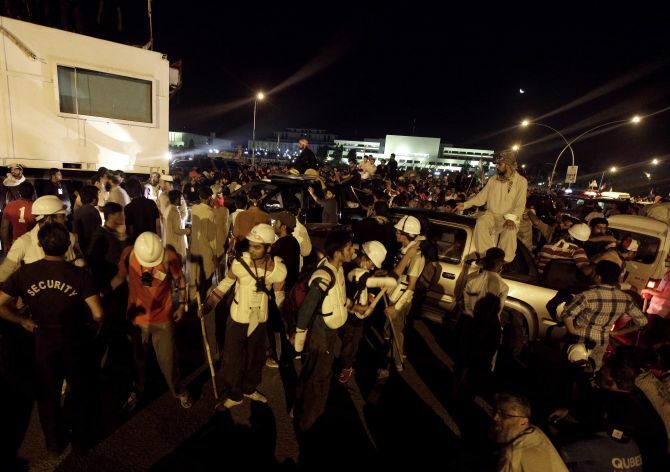 Thousands of Pakistani riot police and paramilitaries are also present in the Red Zone to ensure no violence takes place. Supporters continue protest against Pakistan PM Nawaz Sharif. On Wednesday, Imran Khan issued a new ultimatum saying that Sharif had to resign on Wednesday evening or else they would storm his home. 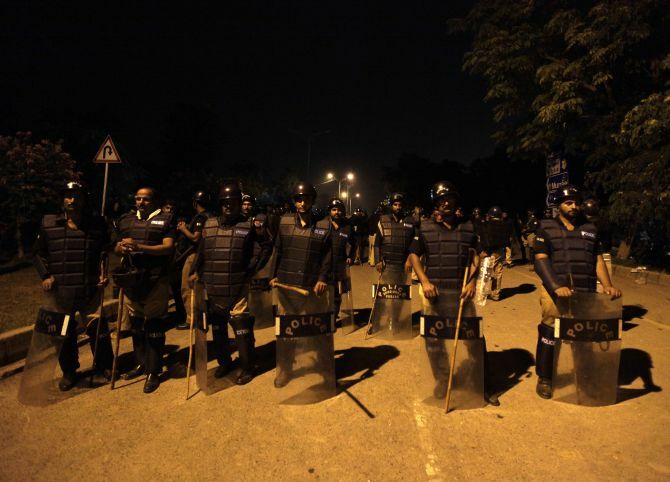 Policemen stand guard against supporters of Mohammad Tahir ul-Qadri during the Revolution March.